Here at St. Mary’s, we have so many active ministries! We are excited to share a bit about each of our ministries in weeks to come. This week, we invite you to get to know the Legion of Mary. Saint Pope John Paul II referred to the Legion of Mary as a Christian inspiration in the modern world. It is the largest apostolic organization of lay people in the Catholic Church, with well over 2 million active members in most every country of the world. It has been active in the United States since 1931, and has been approved by the last 6 Popes and was endorsed by the Second Vatican Council. At St. Mary’s, members of the Legion of Mary get together once per week on Wednesdays, either in the morning at 9am in the Juan Diego Room or in the evening at 7pm in the Church Adoration Chapel. We begin with a rosary where we pray for our parish and community. During our meetings, we discuss the needs of our community and how we can meet them. When we can, we attend 8am Wednesday Morning Mass together. Those of us that are Eucharistic Ministers bring Holy Communion to the sick – the homebound. We participate as Catechists for the children of our parish. We also run the Book Borrow each Thursday, where we hand out books and rosaries to our community during the Farmer’s Market. Additionally, we support the Bereavement Ministry. Being a part of the Legion of Mary gives us, as Catholics, an opportunity to do something positive for the Church while – at the same time – deepening our spiritual life and strengthening our faith. If you don’t have the time to commit to being a member of the Legion of Mary, you can become an auxiliary member. Among other things, auxiliary members pray the rosary each day and keep our ministry in their intentions. 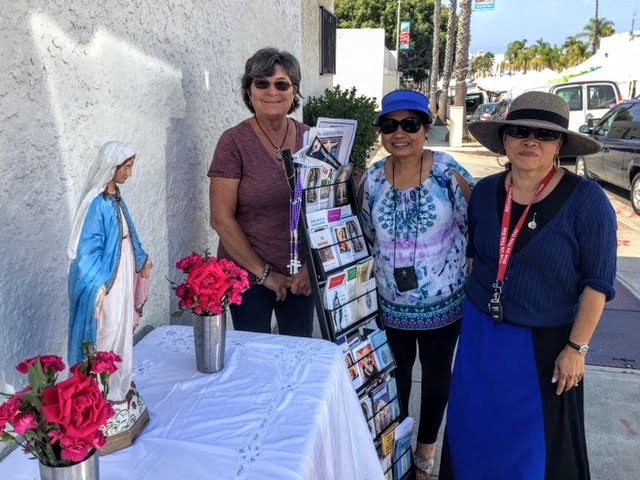 To join us, call Letty at 760-594-7006, stop by our Book Borrow on Thursday mornings in front of the church to chat, or come to a Wednesday meeting. We hope to see you there!